Illinois is dotted with river and rail towns filled with beautiful architecture from days gone past. 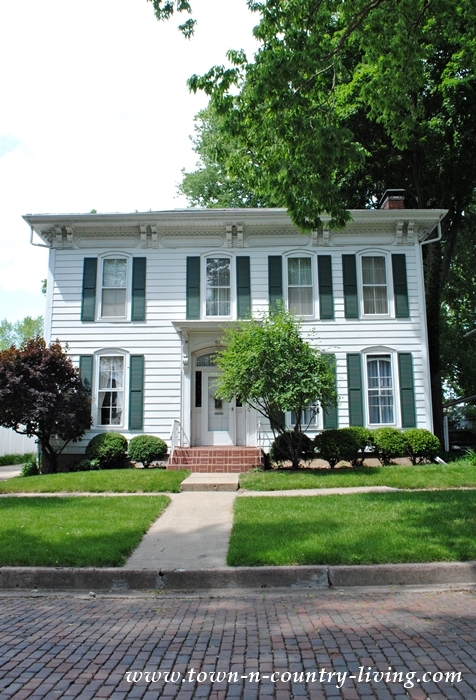 I love the variety of historic homes across the Land of Lincoln and enjoy exploring these little towns that are nestled near venues of transportation in the 1800s, such as rivers and railroad tracks. We recently visited the bustling town of Ottawa, tucked along the shores of the Illinois River. I’d love for you to take a walking tour of this charming town with me. Ottawa is located west of Chicago and is situated where the Fox and Illinois rivers converge. 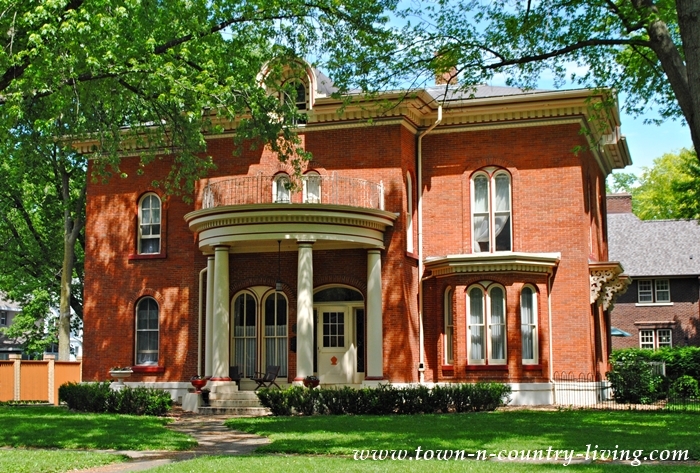 You’ll find plenty of homes with old world charm, like this stately red brick home could be a joy to live in. A series of arched windows add softness and interest to the strong lines of this home. 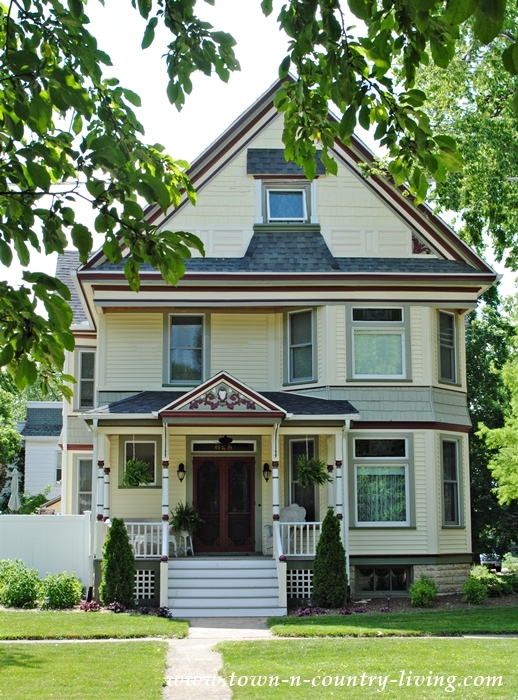 A few more arched windows make their way onto the clapboard exterior of this pretty Victorian. Large trees on the property help to cool the home during the hot and humid summer months of Illinois. 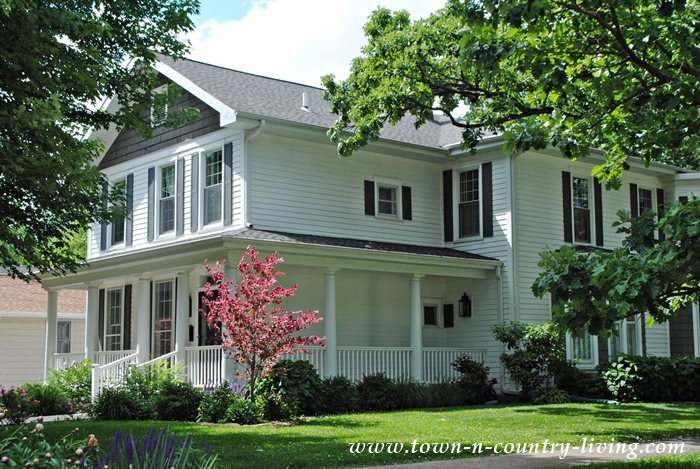 I love this stately white farmhouse with its wrap around porch. 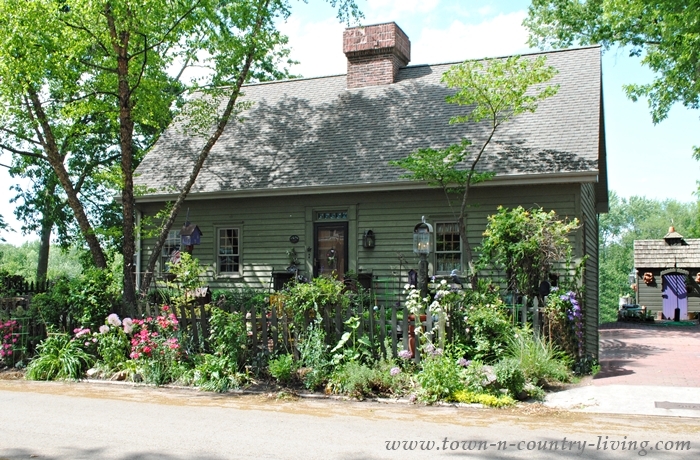 At the back of the property is this charming carriage house complete with flower boxes. 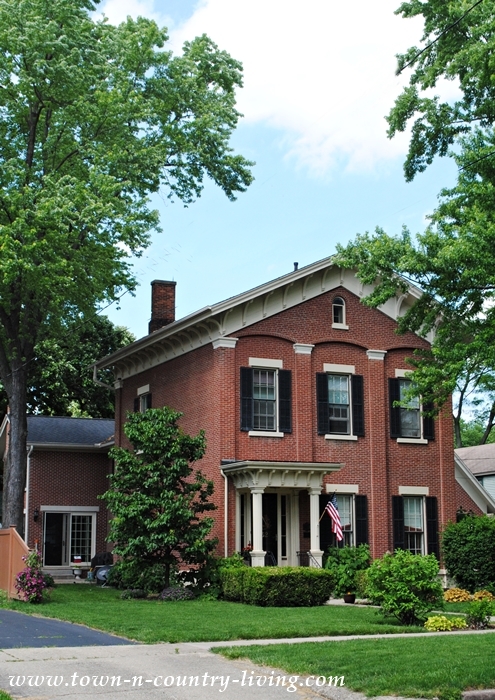 Another red brick home has arching brick work on the front, with architectural detail on the eaves. Walking through the tree-lined streets of Ottawa make you feel like you’re in another place and time. 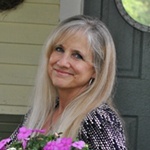 Both hubby and I enjoyed seeing this white charmer. 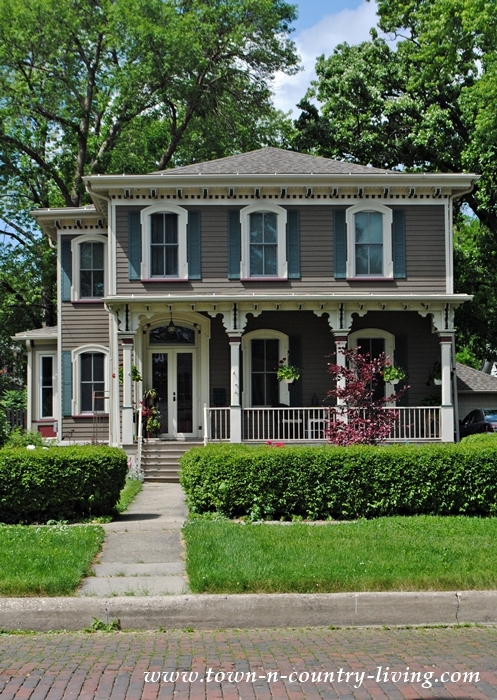 I love the arched dormers and the intricate detailing on the front porch. Not to mention, there’s a porch on either end of the home. 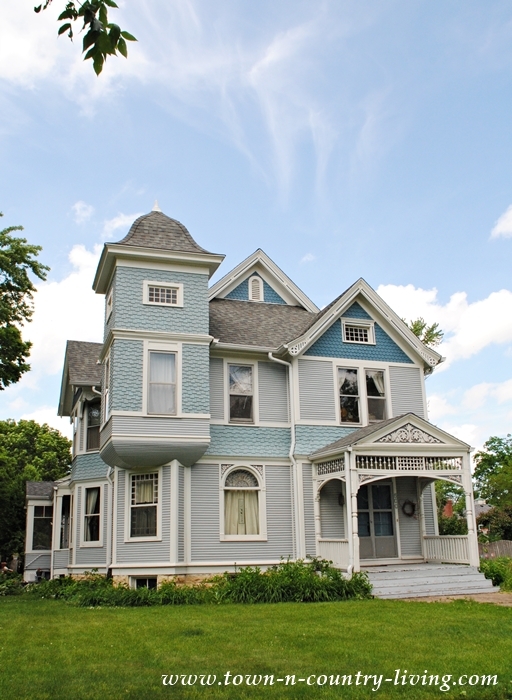 This beautiful home is a fine example of a stick style Victorian house. Popular during the late 19th century, stick style was a transition from Carpenter Gothic to Queen Anne style. Normally I don’t like homes with an oddly asymmetrical exterior. Note that the windows are spaced oddly apart. Regardless, this home has unexpected appeal. Part of that appeal lies with the old-fashioned brick streets. Another beautiful Victorian home on the same brick road. Brown siding and green shutters give this charmer a bit of an earthy feel. 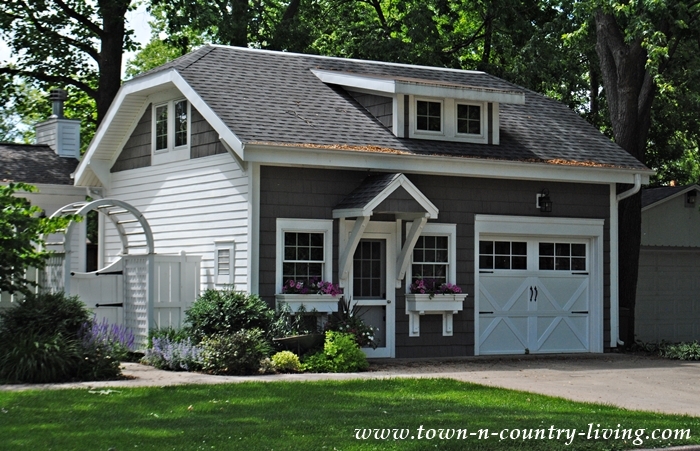 Red siding embraces a low-slung roofed bungalow with its crisp white trim. Neatly sculpted bushes create a natural fence around the perimeter of the property. This blue beauty looks like it was painted with the sky. If you’re like me, when you see a house such as this, you want to step across the threshold and explore every nook and cranny! 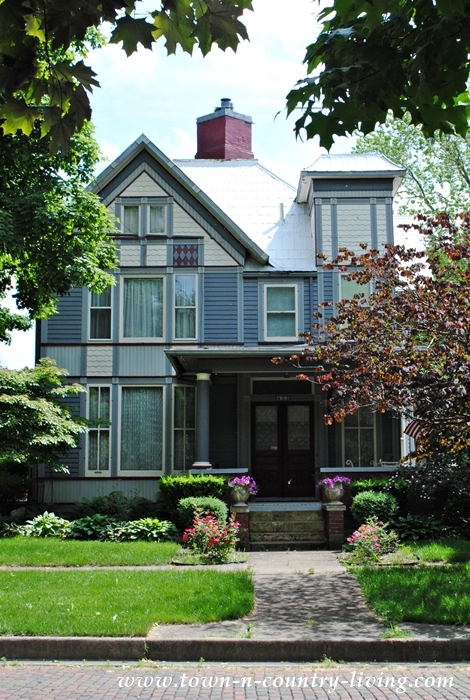 Two-story bay windows grace the front of this Victorian home. Double doors open to visitors and pretty filigree work crowns the porch. A messy cottage garden signifies the home of an avid gardener. 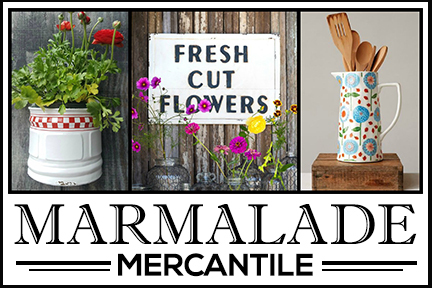 Cottage-style flowers reach for the sky and put on a show for anyone passing by. The home is painted in one tone, allowing the garden to take center stage. 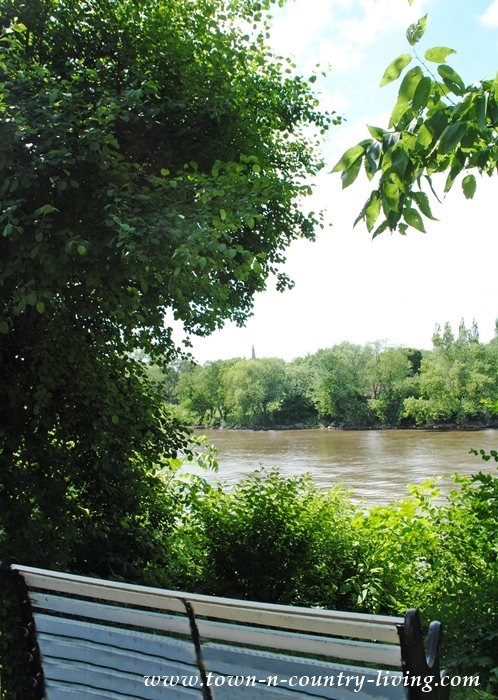 The cottage garden house is perched on a bluff above this river. Such an idyllic place to live. 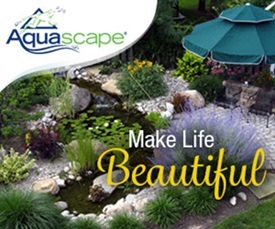 Do you have a favorite home of the ones shown here from Ottawa Illinois? I love looking at houses, I always have! 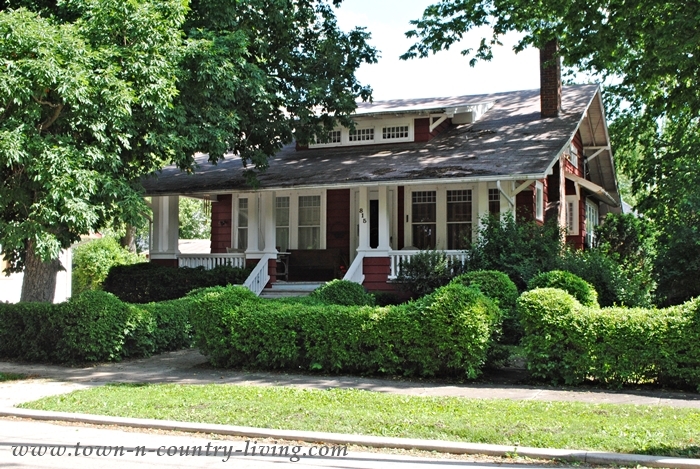 The low slung red bungalow was my favorite, followed by the gardener’s cottage. I love visiting Ottawa – what wonderful homes. 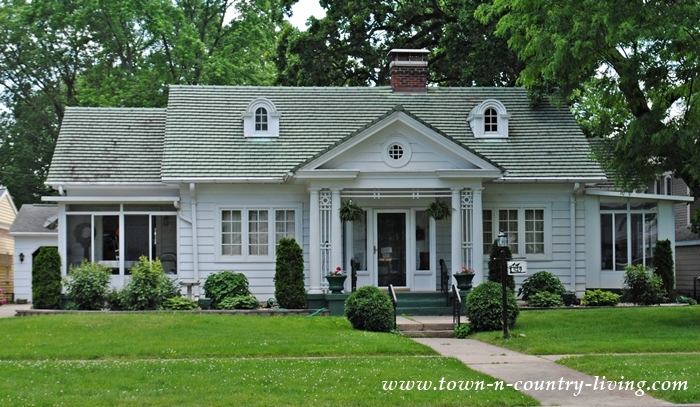 I just LOVE when you feature those beautiful homes in Illinois !!!!! My favorite……the last one, the little green cottage with all those flowers everywhere, I want to move in !!!!!!!!!! I moved away from Illinois many years ago. Thanks for reminding me how pretty it really is and how many wonderful homes are located there! 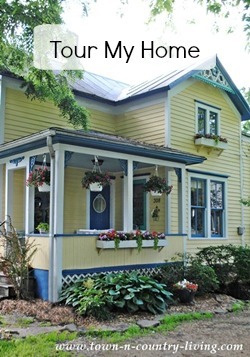 SO many beautiful homes~I love them all, but my favorite is probably the white farmhouse with wrap-around porch and the adorable carriage house. 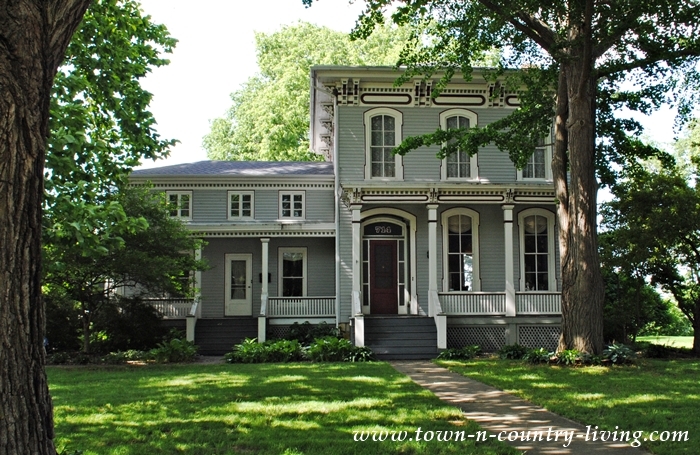 We lived in Glen Ellyn, Illinois from 2010-2012 and seeing these remind me of the Main Street homes and other Illinois towns… We just don’t have as many vintage homes here in Gig Harbor, Washington! Beautiful Jennifer. I have to agree that white charmer with two porches is pretty awesome. Loved the tour. Oh I do love this series. My fave is the white house with the 2 porches and the 2nd brick house. We are being relocated to Illinois from Alabama this summer. I am pretty nervous but some how this walking tour has helped put me at ease. Ottawa is top on our list. We are looking at a rental house on Webster street. I would love to hear your thoughts about that area.